Can the knowledge we have about how organisms grow and behave in outer space help us better understand human diseases such as cancer? Yes, in fact it can. That’s according to Marina Walther-Antonio, Ph.D., an astrobiologist who worked with NASA Astrobiology Institute during her training, examining the biology of extreme environments like those on other planets. Dr. Walther-Antonio has brought that expertise to her research at Mayo Clinic on gynecological cancers, working to unlock the biological processes that may lead to disease. At Mayo, Dr. Walther-Antonio studies the community of bacteria in and on the human body, known as the microbiome. 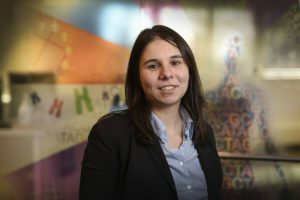 She conducts her research as an assistant professor of Surgery in the Mayo Clinic Center for Individualized Medicine Microbiome Program, with a joint appointment in the Department of Obstetrics and Gynecology. “My goal is to identify genetic and biological differences between patients with gynecological disease and those without these conditions and then develop better individualized prevention, screening and treatment based on these differences. In my earlier work with NASA, I was conducting research that would not be completed in my lifetime but would impact future generations. As a medical researcher, I hope to make an impact on patients now and in the future,” says Dr. Walther-Antonio. When asked about her team’s biggest success to date, Dr. Walther-Antonio highlights the recent published study identifying a unique vaginal microbiome for patients with endometrial cancer. This new discovery could lead to a biomarker for early detection and screening for the disease. It has led to similar research projects to study the impact of the microbiome on ovarian cancer. The team’s collaboration has led to new technologies used to advance their understanding of the human microbiome. “As an astrobiologist, I ‘think without boxes’ when looking for solutions. By collaborating with engineers on the team, we have been able to recreate and develop an optofluidics tool, which merges a microscope with an optical laser tweezer. This technology allows us to observe and manipulate bacteria in its own environment. Using this approach, we will be able to investigate whether the endometrial microbiome plays a role in the development of endometrial cancer,” says Dr. Walther-Antonio. Nicholas Chia, Ph.D., associate director, Mayo Clinic Center for Individualized Medicine Microbiome Program, explains how Dr. Walther-Antonio’s work is speeding the timetable for discovery. “In bringing Dr. Walther-Antonio onto our team, we were aiming to launch the Microbiome Program into using space age technology. In fact, she has done just that by creating technology that allows us to observe single microbes in their environment in a way that we haven’t before. Dr. Walther-Antonio's research on endometrial cancer will potentially cut a decade long scientific process into just a couple of years,” says Dr. Chia. “I first recognized the connection between my work as an astrobiologist and medicine during my training. As I was researching the evolution of multicellularity – how single-celled organisms evolved into multicellular organisms – I realized that many cancer researchers were examining some of the same pathways to understand how cancer develops and spreads. When I was recruited to come to Mayo, I was thrilled to have the opportunity to contribute to medical research,” says Dr. Walther-Antonio. Once she arrived at Mayo as a research fellow in the Microbiome Program, Dr. Walther-Antonio became passionate about Mayo Clinic’s mission to put the needs of the patient first – both in clinical practice and in research. She believes this approach is critical in individualized medicine. “I am inspired by the story of the Mayo brothers, who were visionaries. Our goal is to restore a healthy balance in patients, rather than just focusing on the destruction of the disease. Good doctors treat the disease, great doctors treat the patient. We were the first research team to set up a systematic sterile microbiome tissue collection with the cooperation of surgeons, pathologists and associated medical personnel. This collaboration led to the discovery of the unique microbiome for patients with endometrial cancer. I continue to be inspired by my research, the medical environment and my colleagues every day,” she says. Study: are food and antibiotics linked to irritable bowel syndrome? Get the latest news from the Center for Individualized Medicine. Visit our blog, Facebook, LinkedIn or Twitter at @MayoClinicCIM.